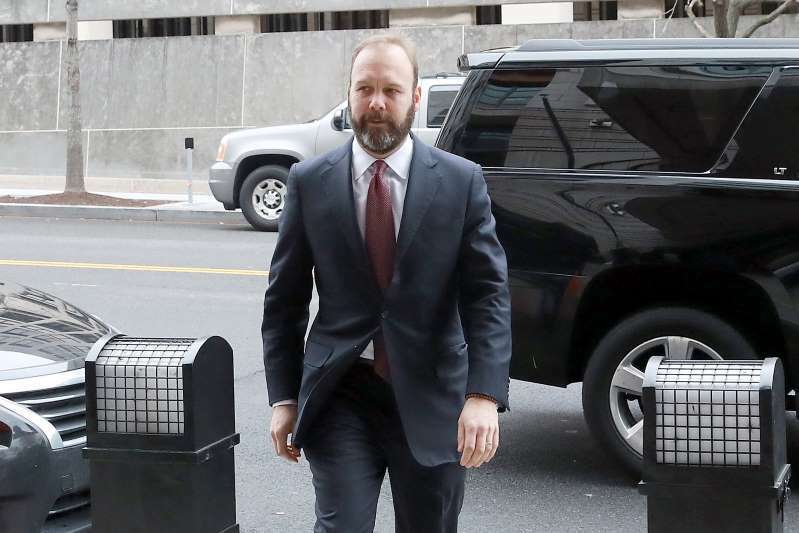 Rick Gates, a top campaign aide to President Trump, detailed in federal court on Tuesday a multiyear fraud by the former Trump campaign chairman Paul Manafort. The defense took aim at Mr. Gates’s credibility. The trial of Paul Manafort turned into a referendum on the character of two of President Trump’s top campaign aides on Tuesday, as prosecutors cast Mr. Manafort as the architect of a sprawling swindle and defense lawyers portrayed the prosecution’s star witness as a thief, adulterer and liar. The testimony managed to further sully the reputations of both Mr. Manafort, Mr. Trump’s campaign chairman for three months in mid-2016, and the witness, Rick Gates, who was the deputy campaign chairman and later the executive director of Mr. Trump’s inaugural committee. Mr. Manafort personally directed the creation of false financial statements to obtain bank loans and deliberately hid income in foreign bank accounts to evade federal taxes, Mr. Gates testified. When one estimate of his tax bill came out too high, Mr. Manafort fired off a furious email to Mr. Gates. [post_ads]“How could I be blindsided like this. You told me you were on top of this. We need to discuss options. This is a disaster,” he wrote in one of dozens of documents that prosecutors have submitted as evidence. Mr. Gates, who is critical to the government’s case against Mr. Manafort, came under cross-examination for the first time, offering a chance to assess how he held up under attacks on his credibility. Mr. Gates’s recounting of Mr. Manafort’s various schemes was almost undone by his description of his own misdoings, including a secret paramour he met for trysts in London. He admitted that he had engaged in so many acts of fraud that he faced up to 100 years in prison if convicted. He acknowledged that he had embezzled hundreds of thousands of dollars from Mr. Manafort, who employed him for roughly two decades, by faking expense reports. It was also “possible,” he admitted, that he had stolen funds from Mr. Trump’s inaugural committee. “Have they confronted you with so many lies that you can’t remember all of them?” Kevin Downing, one of the defense lawyers, demanded when Mr. Gates danced around a question, citing a fuzzy memory. “You seem to have perfect recollection” about Mr. Manafort’s alleged crimes, Mr. Downing said sarcastically. But asked about his own misdeeds, “you seem to be having such a hard time,” the lawyer said to Mr. Gates. Over all, the testimony filled in a picture of two men with few scruples and a powerful thirst for money, hiding payments from Ukrainian clients in foreign bank accounts and deceiving accountants, banks and tax authorities, both individually and together. The pair made millions working for pro-Russian political forces in Ukraine. But once their principal patron, Viktor F. Yanukovych, was ousted as Ukraine’s president and fled to Russia in 2014, Mr. Manafort, at least, was suddenly without his lucrative line of work. Mr. Gates testified that Mr. Manafort’s political consultancy, DMP International, did not have a single client in late 2015 and early 2016. By the time the two men joined the Trump campaign that March, he said, vendors were dunning Mr. Manafort about unpaid bills. They added up to more than $1 million, an accountant testified. Yet Mr. Manafort worked for the Trump presidential campaign for no pay, apparently hoping the connection alone would help him land business. He was booted off the campaign in August 2016 amid allegations about his work in Ukraine. But he still leaned on Mr. Gates to use his influence to help him win favor with the chairman of a bank that eventually granted him $16 million in loans, partly based on falsified financial documents. Mr. Manafort pushed for the banker, Stephen Calk of Federal Savings Bank in Chicago, to be appointed to Mr. Trump’s economic advisory council and to be invited to Mr. Trump’s inauguration, Mr. Gates testified. The trial is the first by the office of the special counsel, Robert S. Mueller III, who was assigned to investigate Russia’s election interference, possible coordination by the Trump campaign and any other crimes he uncovered. Mr. Gates’s testimony, eagerly anticipated since the trial began a week ago, was crucial to the prosecution’s effort to show that Mr. Manafort knowingly defrauded tax and bank authorities and had not simply been tripped up by lazy accountants or confusion about complex tax laws. Mr. Gates testified, for instance, that in October 2016, Mr. Manafort personally falsified a profit-and-loss statement for his firm while seeking to secure a bank loan. In an email, Mr. Gates said, Mr. Manafort sought advice on editing the statement, asking, “How do I convert the PDF into a Word document?” Mr. Gates said Mr. Manafort then changed the document to show that his firm had $3 million in profit instead of more than $600,000 in losses. When Mr. Manafort needed false loan documents — either to reduce his reported income to evade taxes or to inflate it to obtain bank loans — Mr. Gates said he called upon a law firm in Cyprus, run by a man nicknamed Dr. K., to help him create the fakes. His confident delivery turned stumbling when Mr. Manafort’s defense lawyer began delving into financial schemes that Mr. Gates executed for his own benefit, not Mr. Manafort’s. Asked how much of his own income he had illegally hidden from tax authorities, for instance, he said he could not come up with a figure, but had “indicated” to prosecutors that he did not disclose it all. Though prosecutors have introduced a wealth of documentary evidence, Mr. Manafort’s lawyers have argued that their case rests almost entirely on Mr. Gates. He was the only prosecution witness they have cross-examined at length. They planned to continue their questioning on Wednesday. “After all the lies you’ve told and fraud you’ve committed, you expect this jury to believe you?” Mr. Downing asked Mr. Gates, who spent the day on the stand.